As anyone who visits Walt Disney World knows, there are a LOT of souvenir shops throughout the resort. The four major parks, the resorts, the water parks and Disney Springs all are chock full of stores loaded with Disney merchandise. The biggest of these stores is the World of Disney Store, located at Disney Springs. The second largest store can be found in Epcot, and it’s called MouseGear. If you have never been to MouseGear you’re missing out on a lot of great shopping opportunities. And if you have been there I bet you are not aware of all that goes on both behind the scenes as well as “on stage” (the Disney term for the areas guests can clearly see). This blog will enlighten the “never been” and hopefully those who have been to MouseGear will find new things to look out for next visit. 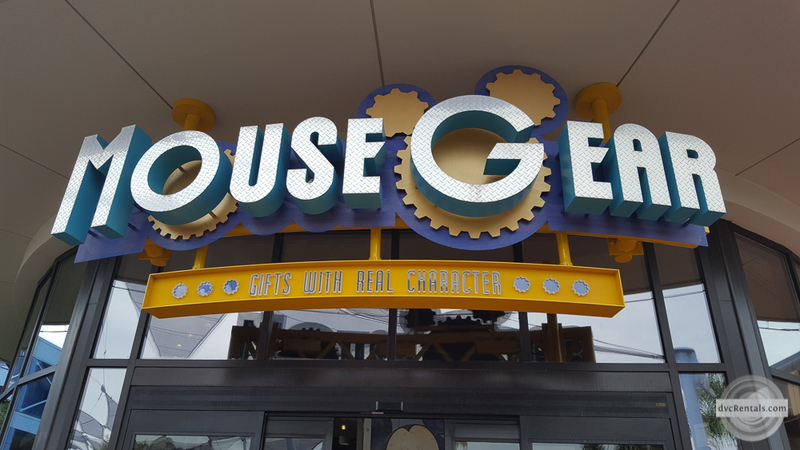 Few current guests are aware that the store has not always been called MouseGear. When Epcot originally opened in 1983 the shop was called the Centorium. The Centorium was a two-story shop, located within an area that was known as CommuniCore. CommuniCore closed in 1994 and was rebuilt into Innoventions, West and East. For a time, the Centorium, remained open even after CommuniCore had become Innoventions. However, in late 1999 it closed and became MouseGear. The current shop is only one level. The upper level is now used for meetings and offices for the leaders and staff at MouseGear. There are four entrances to the store. Two are located next to the large fountain in the center of Future World. At the “head” of the fountain (if you entered from the main gate) the entrance leads you to the hat/sunglasses area known to staff as The Bubble because of the shape of the area. Here is where to find Sunglasses, eyeglass cases, Mickey ears of all designs and sizes, as well as ball caps and other headwear (i.e. “spongy” Goofy and Pluto hats, Headband type hats with many differing designs, visors and more). 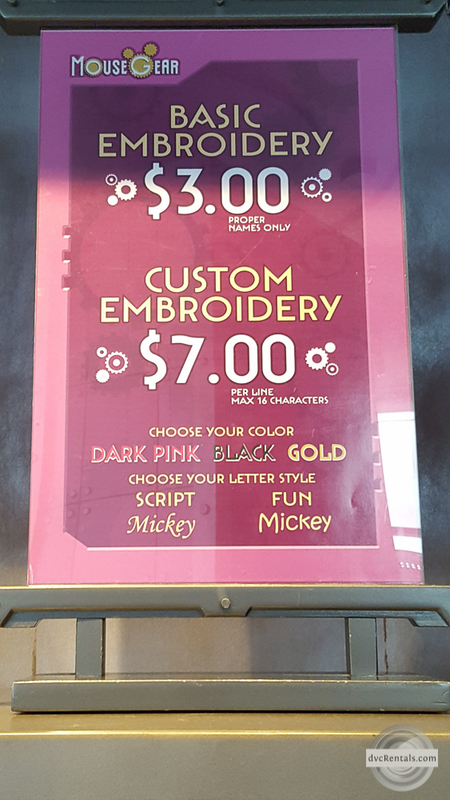 This is the place to go if you want your Mickey ears embroidered. There are 3 choices of embroidery, traditional, script and fun. Traditional is a cursive font, comes in the choices of gold, black and pink and costs $3. Fun and script are thicker thread. The look is more “cute” and is geared towards kids (although many adults choose them). These fonts come in the same colors as traditional and offer the additional options of purple, red and white embroidery. How long you must wait for your hat to be sewn depends on how busy the store is that day. It can be as little as five minutes or over and hour. You have the option of ordering what you want and returning later at a more convenient time to pick up your ears. You also have the option of having your ears sent to your resort if you are staying on property. This holds true for most other purchases, chocolate being the one exception due to the possibility of melting. There is no charge for this service, just request when you make your purchase. If you are checking out that day or the next day this service is not available due to time constraints. 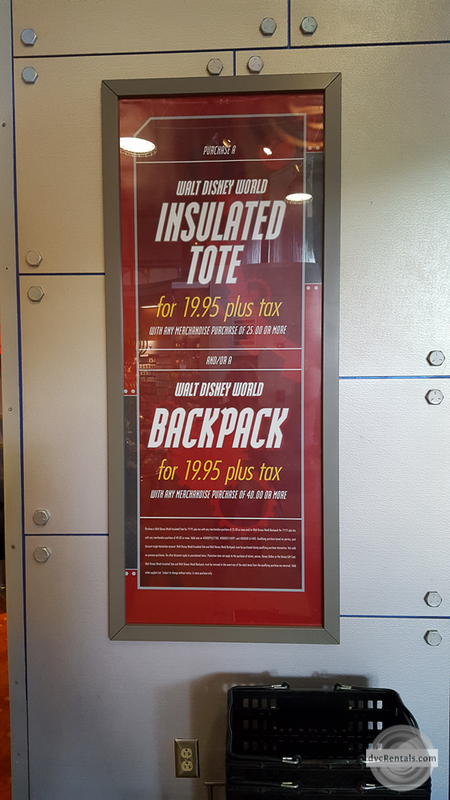 But you do have the option of sending your package to Epcot’s Package Pick Up so you don’t have to carry any purchases with you while you’re in the park. There are two locations to pick up packages, one at the front entrance and one at the International Gateway (near where the Epcot resorts are located). Package Pick Up stays open until one hour after park closing. If you have opted to have your purchases sent to your resort they will be delivered to the gift shop at the resort after 1PM the day after you bought them. As an FYI, this service is not just for MouseGear, most of the stores in Walt Disney World will send your packages to your resort. There is a third option—sending items you bought home. There is a fee for this, depending on how much the total purchase came to. However, if you don’t live in Florida you do NOT have to pay tax on items shipped home, so sometimes the cost can be more reasonable than you might think. If you continue into the store via the Bubble entrance, just past the hats you will find Jewelry (including Pandora) as well as Dooney and Bourke bags on your left. The opposite wall on the right is where you will find Vera Bradley bags and Disney pajamas and loungewear. At the “rear” of the fountain you can find another entrance to MouseGear. At this time that door leads to big room separated into two sections. There is a huge Star Wars area as well as an area termed “Minnie Mickey”. The two sections combined are known to Cast Members as Wand, because a giant wand rotates around the ceiling periodically. (WARNING: The store has a habit of re-arranging things, so if you visit and things look different ask a Cast Member where to find what you need). Minnie Mickey is what it sounds like, souvenirs all related to the head Mouse and his lady friend. Shirts, mugs, blankets, flip flops, small snow globes and Minnie sleep masks are among the items located in this area of the store. Star Wars merchandise abounds in the other half of this area, which recently added a “Build Your Own Light Saber” option. 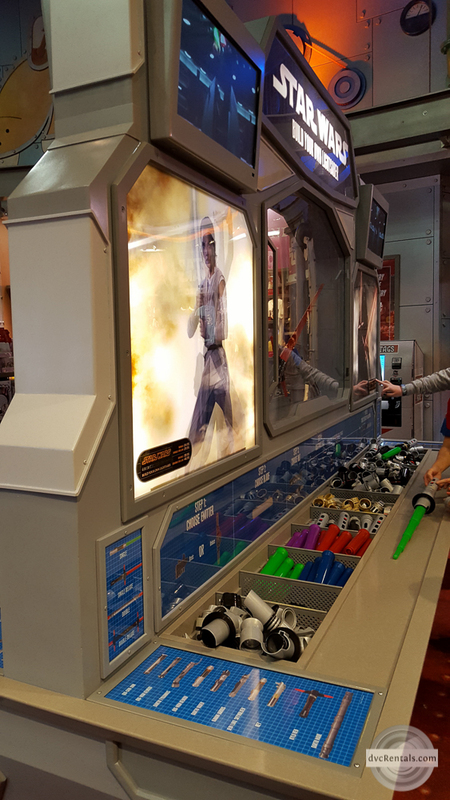 Guests can pick and choose to make their own customized light saber. Single, Double, Single Deluxe and Double Deluxe are the categories to choose from, but it’s up to you to decide what pieces you want on your creation. The pieces are all lined up in a display, and you build as you go. 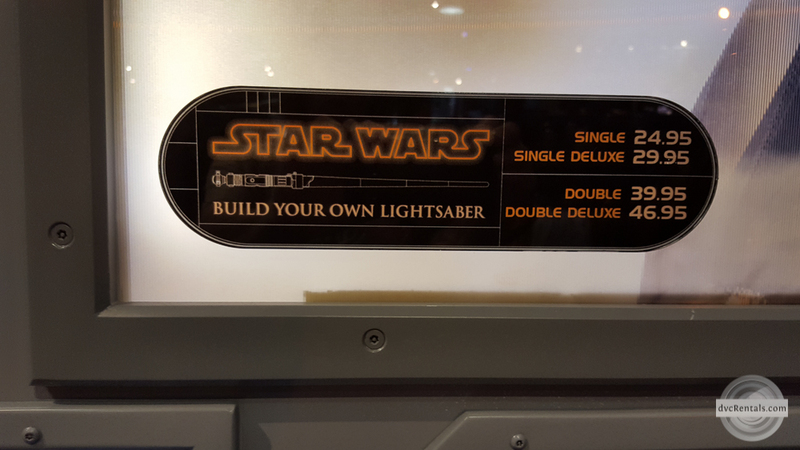 There are many ways to construct the saber, but only one part makes it “deluxe”—the red Kylo Ren piece that juts out (see picture). Prices vary depending on what you select. The Star Wars side of the store also has a Princess area where you can find merchandise related to your favorite Disney princesses. 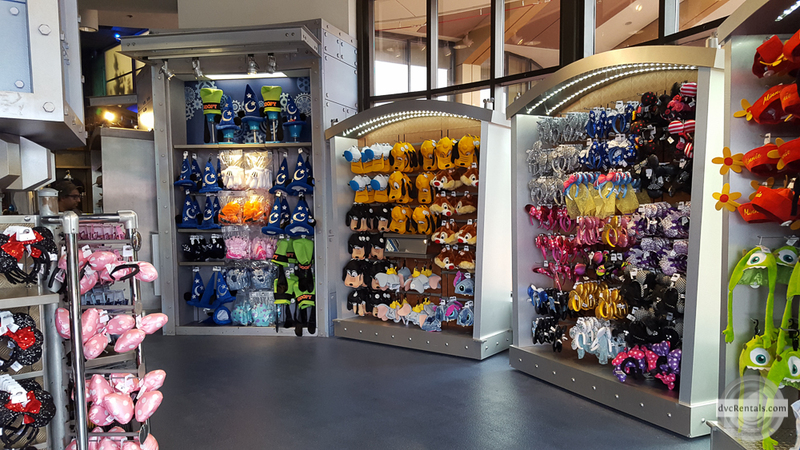 If you enter MouseGear from the breezeway area (between MouseGear and the quick service restaurant The Electric Umbrella) you will find kids, ladies and men’s clothing (including ties and boxer shorts), golf merchandise, as well as souvenirs from recent Disney film releases. Right now, there is a lot of merchandise from Finding Dory. 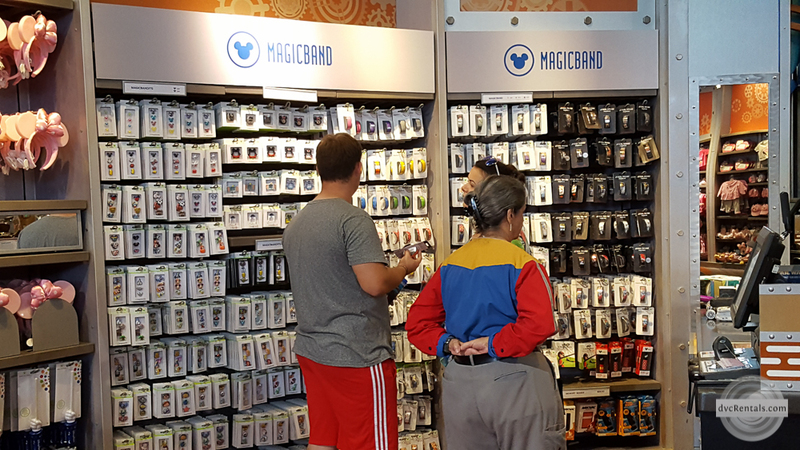 Also in this area, if you look to the left when you enter the store, is a huge display of MagicBands as well as “bling” to add to the bands (i.e. sliders and push pieces that can be added to the band to make it even more fun). If you buy a band they have the capability to activate it right then and there in just a minute or two. Just present your current park ticket or another MagicBand you already have and the Cast Member will gladly activate the band for you. By the way you can have as many MagicBands as you like and all of them will work and have the same information on them. They are each guaranteed to last two years, but my experience is they last a lot longer than that. Can’t find the item you love in your size? Don’t give up! Ask one of the Cast Members to call the stock room and see if they have it in the size you’re looking for. Often the answer is yes and you’ll walk out satisfied. However, if the answer is no there are two options. One, a Cast Member can look on the Merchandise Product Locator to see if what you want can be found elsewhere in Epcot or anywhere else on Walt Disney World property. Look for a Cast Member with an iPad, they can search for you. If you don’t see anyone with an iPad ask another Cast Member, they can locate one for you. The other option is to download the free Shop Disney Parks app on your smart phone. This app will allow you to search for things in Walt Disney World by yourself. It also gives you the option of having these items sent right to your resort (no fee) or to your home (there is a charge, depending on the cost of the purchase). Looking for personal hygiene items, tums, over the counter medication or lip balm? When you enter the store from the Breezeway entrance the first register on your left will have those items. Belts can also be found here. These things are not displayed, they are behind the counter, but if you ask they will gladly get you what you need. The same holds for rain ponchos—they are kept behind the counter, you need to ask for them. (But unlike medication mentioned above, ponchos are not only in Breezeway, each register has ponchos). The last entrance to MouseGear is opposite Test Track and consequently that’s the name that Cast Members use for that area. This part of the store was recently redone. If you go to the right you’ll find Epcot and 2016 items for sale, as well as Home Décor, kids toys, books, puzzles and plush items. If you make a left you’ll find yourself in souvenirs where you will find mugs, glasses, keychains, magnets, antenna toppers, trading pins, lanyards and more. If you keep going left you’ll see bulk candy as well as packaged candy, cookies and other consumable items. Those guests with snack credits will find many options here. Cell phone cases are located just around the corner from the seasonal merchandise. If you are hot there this is a great place to cool off. The store is big and you can spend a LOT of time meandering around looking at things. The A/C in the store works very well. It’s also a good option to duck out of the rain. Pin traders will be in heaven at MouseGear. Each Cast Member is required to wear a lanyard with pins, so there are many trading opportunities. Additionally, from 1-1:30 and from 5-5:30 daily a huge pin board with over 100 pins is brought out for guests. The board is located by the Test Track entrance. Hidden Mickeys abound throughout the store. 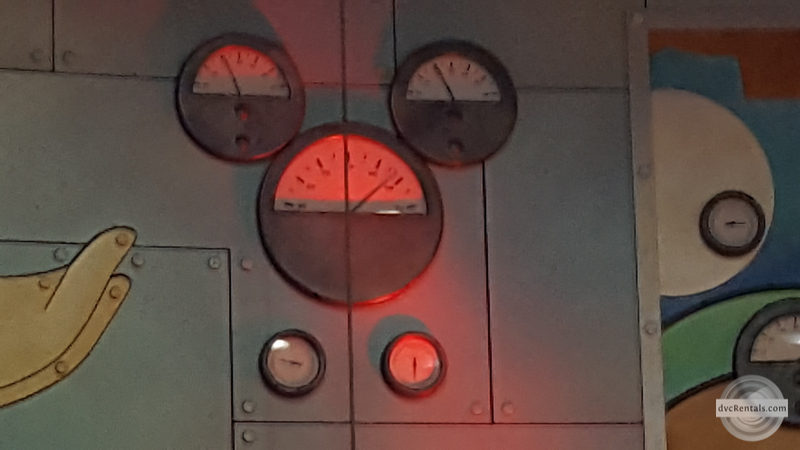 The “gear” part of MouseGear invites many opportunities to have the three circles that make up a hidden mickey incorporated into the décor. Not everyone realizes there is a fitting room at MouseGear. It is called “Fit and Finish” and is located across from the Test Track entrance and slightly to the right. The doors are kept locked, and although usually there is a Cast Member to let you in sometimes you may need to find someone to unlock the door. If you buy something at MouseGear (or anywhere on Walt Disney World property) you do NOT have to make a special trip back there if you need to return the item for any reason. With very few exceptions you can return or exchange an item bought at any of the Walt Disney World stores anywhere on property, including your resort if you’re staying at a Disney hotel. Sometimes special events occur at the store. Not long ago author Ridley Pearson was at MouseGear, signing his books and posing for pictures with guests. Keep your eyes open for what are known as “Purchase with Purchase” deals. These are items, usually displayed behind the counter at any of the registers that are priced at a lower price than normal if you spend a certain amount of money on other items. For example, you might find a quality backpack for $20 that would normally cost double that, but you must spend $40 on other merchandise to qualify to buy the backpack. 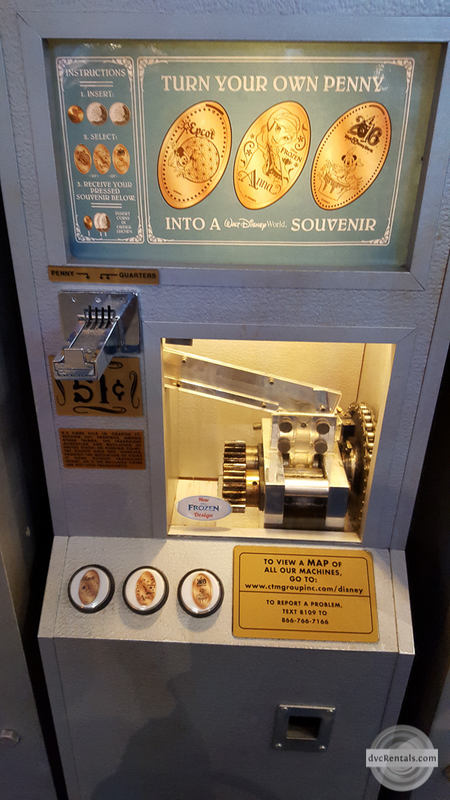 If you like pressed coins MouseGear has three machines! Two are for pressed pennies and one is for pressed quarters. Ask a Cast Member for the locations, they are spread throughout the store. MouseGear has a huge selection of Antenna toppers in the souvenir section near the Test Track entrance to the store. There is a nice selection of pet toys, leashes, collars and bowls located near the register closest to the Test Track entrance. Batteries, pressed penny books, World Showcase Passports and other miscellaneous items can be found on the queue lines. As things do tend to get re-organized frequently if you can’t find something you need, don’t hesitate to ask. Need a birthday, anniversary, first time visit or family reunion button? Ask anyone at one of the many registers in the store, they will gladly give you one (free!) and write your name on it if you wish. So, there you have it! I am sure I have left out some items, but I tried to cover most of what is sold at the store. MouseGear truly has something for everyone and is a fun place to shop. Plus, the store has some of the nicest, friendliest and most helpful Cast Members on property – not that I’m biased at all! 10 thoughts on "Everything You Always Wanted to Know about MouseGear"
This is my favourite gift shop in Epcot! You said “You also have the option of having your ears sent to your resort if you are staying on property. This holds true for most other purchases, chocolate being the one exception due to the possibility of melting.” Actually, they won’t transport ANY food, including things like tea bags, which don’t melt, as we found when we shopped at the UK shop in Epcot. Can someone explain why that entire area often smells like sewage? We’ve been there at several different times of year and there’s always a smell. That’s my favorite store out of all of them at Disney World!